A ontologia está intimamente ligada com a metafísica sobre a natureza e as relações do ser e da existência especificamente. Essencialmente a teoria do ser ou o estudo da existência. Os ontologistas não necessariamente se envolvem na tentativa de definir o que é existir, mas sim de forma abrangente abordar o que realmente existe. A ontologia não lida com as especificidades da existência como ver se uma espécie de pássaro é existente, nem a ontologia endereça a categoria ainda mais ampla dos pássaros. A ontologia realmente lida com as noções de se alguma coisa até mesmo existe, propriedades e relações imateriais, materiais, mundos possíveis e como são todas as áreas de estudo dentro a ontologia. É impossível fazer ciência sem pressupor algum tipo de ontologia metafísica. Por exemplo teístas e ateus cada um mantém uma ontologia muito diferente. Enquanto o primeiro vê o cosmos como uma construção ordenada de um ser divino, e o ser humano constituindo uma realidade imaterial, o último (ateísmo) assume o Universo como apenas o caos material e aleatório. Da mesma forma, o evolucionista percebe a humanidade como nada mais do que um animal, enquanto os criacionistas se referem a humanidade como criada à imagem de Deus. Visualizações ontológicas fornecem uma parte de um pressuposto subjacente (filosofia) que rege as teorias da ciência que pretendem interpretar alguns aspectos do mundo natural. 1. É possível que Deus exista. 2. Se Deus é possível, então ele existe em um mundo possível. 3. Se Deus existe em um mundo possível, então ele existe em todos os mundos possíveis. 4. Se Deus existe em todos os mundos possíveis, então ele existe no mundo real. 5. Se Deus existe no mundo real, então Deus existe. O argumento não afirma que mundos possíveis existem na realidade. Na lógica modal, eles são usados para explicar as coisas. Por exemplo, algo é possível se ele existe em um mundo possível. A declaração não afirma que eles realmente existem, mas é como sabemos que eles são possíveis. Premise 1 states it is possible that God exists. This is to be accepted as true unless it is proven false. There's absolutely no reason to deny the possibility of his existence, which is a valid reason to accept he is possible. It you object to that, then you must provide evidence for atheism because you object to assuming anything at all without evidence. Premise 2 is true by the definition of possible in metaphysics. A statement or thing is only possible if it exists in one possible world. As God is possible, we know this premise is true. Premise 3 is true by the definition of God. It is better to be necessary(As in, exists in all possible worlds.) than to exist contingent. (As in, exists in only some worlds.) This is also consistent with God being omnipresent. God is by definition, omnipresent, meaning he exists everywhere. That would mean he exists in all of the possible worlds. Premise 4 is true because, if God exists in all possible worlds, and we exist in a possible world,(The actual world.) Then God exists in out world. Premise 5 is axiomatically true. Premise 6 follows all of the premises. Existence is being in relation to a property which is called the predication relation. Because there is actual difference between existence and non-existence that difference is not the same as the property of being red. When something comes into being or comes into existence it has to have at least one property. This follows that if a human being is born than the one property is human. Nothingness, philosophically speaking, has no properties and since it has no properties there is no existence. Nothingness properly understood would mean non-being or non-existence, literally nothing. Zeus and other Greco-Roman nature gods and goddesses created by man do not actually have existence and are cases of nothing because there are no real properties. The monotheistic religions hold to one sacred doctrine, God is one and there is only one God. During Biblical times, this view was in stark contrast to the polytheistic religions (many Gods) practiced by the Greeks, Romans, and Egyptians. 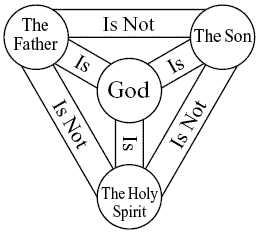 The Trinity of God is central to Christianity. It is a word from the Latin Predefinição:Latin Name2, meaning "threeness". Neither that word nor any equivalent occurs in the Bible, but the doctrine is logically derived from many statements spread throughout the Scripture. The very first word used for God, at the beginning of Genesis, is (Predefinição:Hebrew Name), which is a plural word, literally "gods". While the Hebrew word Elohim is plural, it is usually followed by a singular verb when referring to YHWH as in Predefinição:Bible ref where the verb Predefinição:Hebrew Name2 is singular — literally meaning "He created", possibly insinuating the mystery of the Blessed Trinity, while Elohim when referring to pagan gods is generally followed by a plural verb. There are exceptions to this rule as Elohim, when referring to YHWH, is followed by a plural verb in Predefinição:Bible ref, Predefinição:Bible ref, Predefinição:Bible ref, and Predefinição:Bible ref and it can be used to refer to a single non-Israelite god, as in Predefinição:Bible ref, Predefinição:Bible ref, Predefinição:Bible ref, and Predefinição:Bible ref. The plurality and unity of God are both evident at the very beginning. The covenant established between God and Israel is reliant upon the recognition by His people that God is the one and only God, and strong warnings were given in the Old Testament against making and worshipping idols - a practice which was common at the time even among the Israelites. The importance of this law is illustrated by its being the first command of the Ten Commandments given to Moses. It should be noted that the "other gods" warned against here are not gods at all, but substitutes for God (idols), or simply mythological. The New Testament also echoes this central theme. The "Shield of the Trinity", which portrays the components of God and their relationship. Humans are described in the Biblical book of Genesis as being made in the image of God. There are 2 basic definitions of the image of God. Adam was created to reflect the spiritual nature of Elohim. This belief, by far the most widespread among theists, holds that Adam was created in God's spiritual image, to reflect his reason and personality and ability to communicate. However, it is not believed that Adam was created in God's physical image, because it is believed that God has no physical existence or appearance. Adam was created to reflect the physical appearance of Elohim. This view, much less common than the spiritual view, provides that Adam was created in the physical image of Elohim. It is often said that this view is based in part on corporealism, or the belief that God has a physical body. However, God in His omnipresence is not corporeal, but is Spirit (John 4:24). The same words used for image (Predefinição:Hebrew Name2), and likeness (Predefinição:Hebrew Name2), are used to describe the sons of the patriarchs. Elohim is plural, derived from the many references to such with phrases of; "Let Us make Man in our image," implying that the Elohim is plural, to include YHWH Elohim and the Sons of God, as well as the Holy Spirit decided to create man in their image. YHWH Elohim (translated in this instance as "Lord of the gods") is described as physically walking through the garden. ↑ 4,0 4,1 4,2 Morris, Henry M., The Genesis Record. Grand Rapids MI: Baker Books, 1976. p.74. The Church of the Holy Trinity By Robert Doyle. Originally published in Briefing #121. The Oneness of God online book by By David K. Bernard, J.D. Esta página foi modificada pela última vez à(s) 13h56min de 18 de março de 2017.